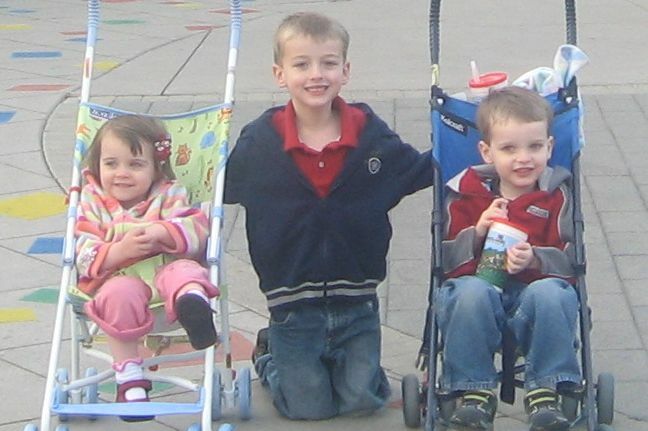 On October 16, 2008, then 7-year old Hank was diagnosed with Parry Romberg's Syndrome. When Hank was 5 years old, he developed a red rash on the left side of his face. We rushed him to the doctor who said it was just an allergy. That "allergy" continued through the fall, winter and spring...turning from red, to pink, blue,white and back to pink. Another trip to the doctor who referred us to a dermatologist, who diagnosed it as "atopic dermatitis" and handed us some cream. And so the discoloration continued throughout kindergarten and first grade. During the summer between first and second grade, the side of Hank's face developed mocha-colored streaks that went from cheek to neck. Another visit to the doctor...more questions, no anwers. At the end of summer Hank started to look a little tired, puny and even sickly. And still no answers. By October, Hank looked worse and we couldn't put our finger on what was really happening. By luck, we had spent the day with Hank's cousins and his Aunt Barbara, my sister. That night Barbara told me that there was something wrong with Hank's face. I told her I knew that he looked puny, but I couldn't figure out why. Barbara looked at me and said, "His face is not symmetrical. His cheek is missing." That was it! I knew she was right. I ran upstairs, to where Hank lay sleeping in his bed. I placed my hands on his face and could feel the difference. His right cheek was full and his left cheek felt like skin on bone. How could this be? WHAT could this be? The next day I took him to our pediatrician and brought along 3 years worth of school photos. The doctor gave Hank a full exam and was at a loss to explain the changes to Hank's face. But he could see the changes as well. We scheduled a skull x-ray for the following day and went home. That night, at 7:00 pm, the phone rang and the doctor's voice said, "I know what it is." He told me it was "Linear Morphea", or "Parry Romberg Syndrome". I sat at the computer and typed the words in. What popped up terrified me. A rare, progressive, incurable auto-immune disease that causes your face to WASTE away? Not a rash? Not an allergy? Not dermatitis? How could this be? I started searching the Internet for more information on PRS. I found the photos of those who have been decimated by this disease and read their stories. They were so heartbreaking and upsetting, but I couldn't tear myself away from their compelling stories. All of these brave people who had lived with this disease for so long. But almost all of them talked about the terrible low self-esteem they suffered from. Difficult teen years, taunting from peers, second looks and stares, dateless nights and more. This was not the life I wanted for my little boy. There had to be an answer to this disease. We had about 10 doctors' visits in 6 weeks. We saw specialists at UCSF who prescribed "methotrexate" which is chemotherapy and steroid infusions. We were scared to death. We talked to other parents through the "Romberg's Connection" support group, who had children going through the prescibed protocol. Most seemed to be doing well. But in my heart I knew this wasn't the way for us to go. On New Year's Day 2009, I received an email from a woman who had a 7 year old son, who was also battling PRS. She asked if she could call me. I quickly emailed her my phone number and she called right away. She told me about a doctor in New York who performs surgery on Parry Romberg patients. But wasn't reconstruction...it was intervention. What? New word! A new idea and a new hope! I emailed the doctor and he called me back. We had a few phone conversations, I sent photos of Hank and he told me to bring Hank to New York. On March 18, 2009, we sat in the office of Dr. John W. Siebert. He sat and looked at Hank for a long time. He chatted with him and joked with him, putting us all at ease. He said Hank had a "classic" case of PRS, and that he could fix it through surgery. And for the first time since Hank's diagnosis, we finally thoroughly exhaled. We left the appointment with feelings of real hope and relief! The surgery is a micro-vascular free-flap "tissue transfer" where the infected tissue in the face is removed and replaced with clean tissue and blood vessels, taken from elsewhere on the body. It is thought by intervening early, the biology of the disease can be changed, thus halting the atrophy. Hank is scheduled for surgery this summer in New York! Hank is a bright, and happy kid with a great sense of humor and a love of reading and practical jokes. He is a tolerant and fun big brother to his little brother and sister and a loving son to his parents. Hank knows about his illness (although not the severity of it) and is aware of the surgery. By the end of August, Hank should be ready to start 3rd grade with a healthy body and a complete face! Hank's second surgery took place on December 2, 2009, in NYC. This was a revision surgery where the new tissue was redistributed. Hank did well during the surgery and although he looked like he had been in a prize fight, he recovered quickly. Hank went right back to school just 2 weeks after surgery. We continue to send photos to Hank's surgeon every 4 - 6 weeks and will be heading back to NY again this summer for a post-surgery evaluation. It will be determined between now and then if Hank will need another surgery during that visit. Hank's surgeon believes that the atophy has been arrested, and the progression halted. We continue to monitor Hank but remain optimistic that this is true! Hank is feeling good and is currently taking Drama classes after school and will be in two plays this spring! CONGRATULATIONS FEB. 2010 STUDENT OF THE MONTH! WAY TO GO HANK! Hank is back from his surgery in NYC and doing well. He is bruised and a little swollen, but in the best of spirits! Hank has fully recovered from his last surgery. He is feeling great and looking great too! He continues to meet and encourage others with PRS who are looking into surgery. Hank's surgeon would like to see him next summer, but it won't be a surgical visit! After reviewing Hank's spring photos, Hank's surgeon suggested another surgery to suspend his lower eyelid more and at the same time bring his flap up slightly and debulk just a tiny bit. After careful consideration, and with the doctor's blessing, we have decided to wait a year, so that Hank can have a normal, surgery-free summer and just be a kid! Hank is feeling good, maintained straight A's throughout 4th grade, joined band, played on a baseball team and learned to ride a bike. He is loving the normalcy of his summer and we think he needs the time to heal both physically and emotionally. Our plan is to go see Dr. Siebert this fall. When you have just one doctor in the world that can treat you, you don't want to let any opportunities pass you by. We need the care that only he can offer. We continue to hold fundraisers to pay for last year's surgery as well as next year's surgeries and beyond. It is our hope that insurance companies will recognize that PRS is a real disease and no 9 year old gets a face lift for cosmetic reasons. Our goal is to raise awareness of PRS and through research find a cure for this "incurable" disease! Hank had a great doctor-free summer! Swimming, camping, bike riding, jet skiing, and even a trip to Legoland! Great time to just be a kid without all the pressure of surgery! Submitting new photos to Dr. Siebert this month. Looking to see if we will be traveling to Madison, Wisconsin or NYC sometime in the next 30 days. All depends on what the doctor thinks of the latest photos. We anticipate a definite surgery this summer... Hank is enjoying 5th grade, excelling in all subjects and playing drums in the school band. We are grateful that he is enjoying a "normal" life for the time being. We postponed all medical-related travel last year, in hopes of giving Hank a "normal" summer and school year. It has been two years since he has seen his surgeon... Hank has been experiencing terrible "ice pick" headaches and we are concerned. Hank will be having the revision surgery that we put off last summer, this October 2012. Hank just celebrated his 11th birthday and is enjoying the carefree days of summer! On October 1st, we took the whole family to Madison, Wisconsin. On October 3rd, Hank had his fourth surgery at the American Family Children's Hospital, again with his surgeon Dr. John Siebert. This was a tough surgery for Hank and a bit more involved than we expected, but he recovered well. (Those first few days were rough!) We were fortunate enough to stay at Ronald McDonald House, which made our stay not only easier financially, but emotionally as well. 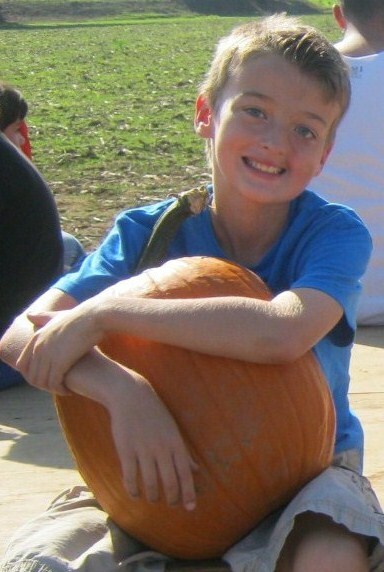 We returned home on Oct. 11th and Hank was back to school on October 15th...just 12 days after surgery. Hank continues to heal and his prognosis is good. We were pleased to learn that his bones are straight and unaffected by the disease and there was no active PRS present in his face. We will continue to send photos to Hank's surgeon and plan to see him again next summer...hoping that it is just a check-up and no more surgery! We have experienced a set-back... Around Thanksgiving, we noticed Hank's eye was starting to open at the outside and look "droopy" again. After sending photos to Hank's surgeon, he wondered if Hank's orbital bone had "dropped". In a panic, we contacted Hank's pediatrician and ordered new X-rays. Hank's radiology and pediatric staff worked together to get Hank's X-rays ordered, taken and processed all within 24 hours...and we sent a disc with Hank's new X-rays, as well as from 2008 (at time of PRS diagnosis), and even ones we had forgotten about from 2006, when Hank fell on the kindergarten playground and may have possibly had a fracture (he didn't). It was great to have X-rays from all three circumstances! The best guess right now, is that Hank has scar tissue that has built up from his last surgery, where they went through his lower eyelid. The scar tissue is pushing the lid away from the eye and causing what we are seeing. We think that perhaps the swelling of Hank's cheek area might also be pulling the eye down with the weight of it. Hank's surgeon is conferring with his constituents in Madison and NYC, to determine the best Ophthalmic and Orbital Plastic Surgeon in the San Francisco Bay Area...about 2 hours from our home. If he also agrees that it is scar tissue, Hank will need to undergo another surgery to make the repair...most likely taking tissue from the roof of his mouth and inserting it into the lower eyelid. We understand that it is a very painful process and one that takes awhile for the pain to subside. Hank is now 12 and his eye looks worse. We never made it to a plastic surgeon to address his eye...We knew we could not put Hank through another surgery so close to the one he just had. That last surgery was so hard on him...emotionally and physically...and we promised him no more surgeries unless he asked for one or it was medically necessary. All that has changed. We notice that Hank's face looks "flatter" under his eye and his eye looks like it is being pulled down. After sending photos to his surgeon and an immediate phone call in response...we now know that Hank will need another surgery. Looks like his "flap" may have folded on itself or something. We don't really know...but we do know that in June, we will need to head back to Madison for another surgery. Hearts are heavy with this news...Hank doesn't know yet. .. But no matter what...we still do not have any regrets in regards to the course of surgical treatment. Hank is happy and well adjusted. We moved to a different city in August and he has fit in well at his new school...running for the cross country team in the fall and is ready for track in the spring! So although, this is not the news we want...we are grateful that he is strong, healthy and happy! At the end of April, we took Hank to the eye specialist at the University of San Francisco (UCSF) Medical Center. The good news, is that Hank's eye's are symmetrical, well within the normal range. The bad news is that Hank has some bone deterioration of his cheekbone, and according to UCSF, needs bone surgery. 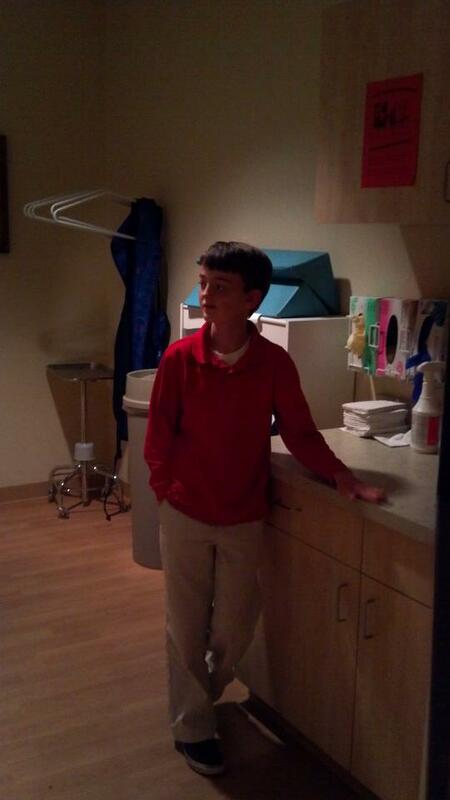 After talking to Hank's surgeon, Dr. Siebert, we know that Hank is too young for the bone surgery...being just 12 and growing at least 5 inches in the last 10 months...he is growing and changing daily. According to Hank's surgeon, he is about 5 years away from any bone surgery, but is in need or a tissue rearrangement and a lower eyelid lift. ** We are in Madison now. 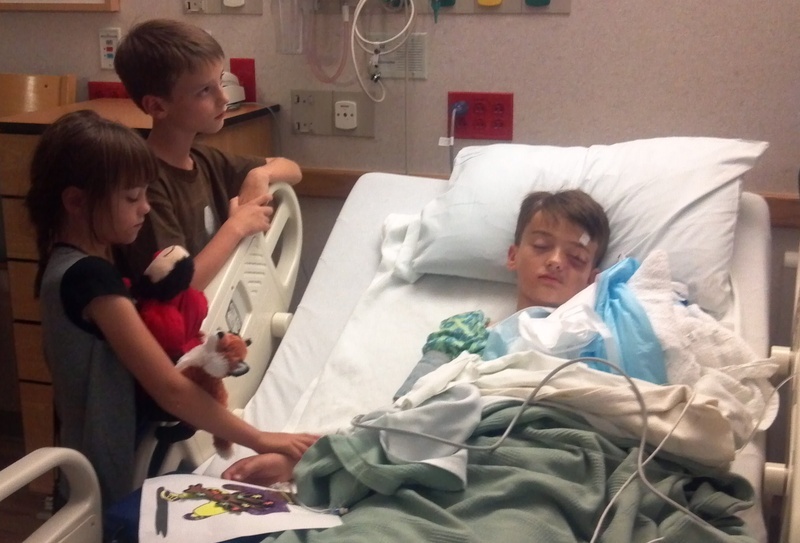 Hank's surgery was June 19th and he is now recovering at the Ronald McDonald House in Madison, Wisconsin. The road to recovery is never easy and for some reason this time, it is particularly difficult. Please keep Hank in your prayers as we prepare to celebrate his 13th birthday away from home (June 24th) and hope he is able to enjoy the day. It's 10 months since Hank's last surgery...and he has been feeling great. A few months after surgery, we noticed that his face was flattening out a bit. We realize that his left cheekbone did not grow at the same rate as the right, at that the bones were affected after all. It looks as though Hank will have to undergo bone surgery to fix the issue. But with Hank being just 13, that surgery will need to wait until he is done growing. An unexpected turn of events for Hank. With no current plan in place, Hank was nominated to journey to Lourdes, France for a healing pilgrimage with the Order of Malta. With 150 nominated in the western US, and only 50 selected...we hoped he would be selected...and he was! We are now preparing to leave for Lourdes. Lourdes is the place of many miracles. Of course we are praying for what we want for Hank, a cure. But healing can come in many ways, and whether it is physical, mental of spiritual...we know that we will forever be changed. Please keep Hank in your thoughts and prayers as he makes this most remarkable and rare (like him) journey. We are so grateful for the love and support that Hank has received through our parish church, Old Mission and through his school OMS. 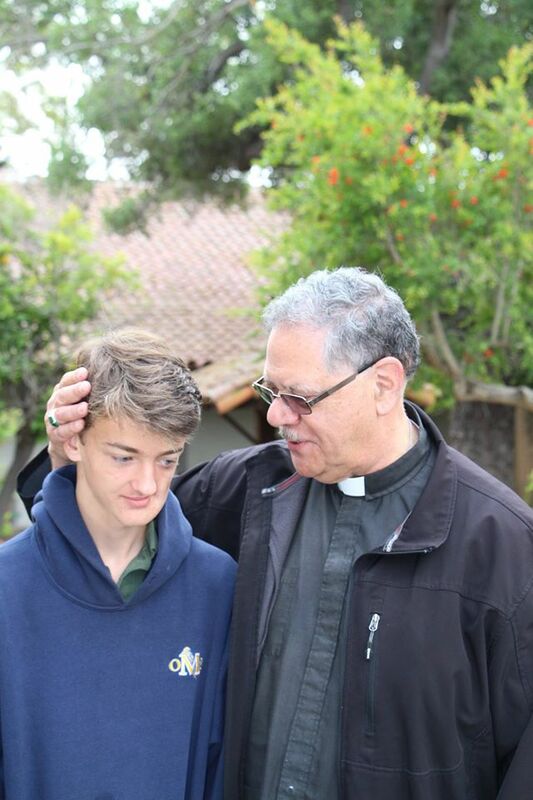 The Bishop came last week and blessed Hank as he prepares to embark on his spiritual journey. We carry the prayers of many with us! The Miracle of Lourdes: "In 1858 in the grotto of Massabielle, near Lourdes, France, the Blessed Virgin Mary appeared 18 times to Bernadette Soubirious, a 14 year old peasant girl. 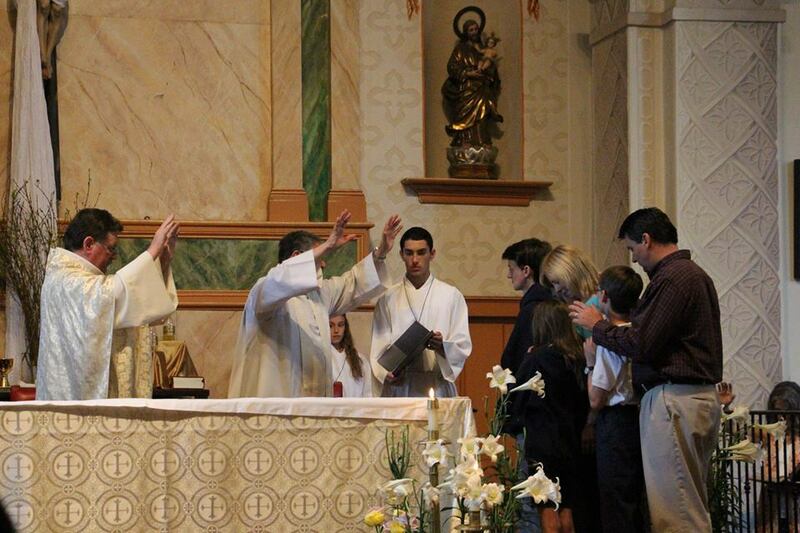 The identified herself at The Immaculate Conception. She gave Bernadette a message for all: "Pray and do penance for the conversion of the world." The Church investigated Bernadette's claims for four years before approving devotion to Our Lady of Lourdes. Lourdes has since become one of the most famous shrines, attracting more than 5 million pilgrims each year. There have been thousands of miraculous cures at this shrine. Hank has been doing great, enjoying his first year of high school, running cross country and track and working hard. In October 2015, Hank stated that he thought he needed some sort of surgery. We have known that Hank will need bone surgery in the future, but at 14, is still too you young. He has grown so much in the last two years that things have shifted. After consulting with his doctor over the next six months, we decided that it was time. We are now in Wisconsin, where Hank underwent surgery on July 7th. Hank had a tissue revision, moving tissue up from his jaw area to his cheekbone, an eye lift and additional tissue taken from his abdomen and used for his revision. The good news is that his original flap has held and everything looks healthy. We will be here in Wisconsin for another week as we wait for Hank to recover.